The African barbets consists of 42 species ranging from the type genus Lybius of forest interior to the tinkerbirds (Pogoniulus) of forest and scrubland. They are found throughout sub-Saharan Africa, with the exception of the far south-west of South Africa. The African barbets are colorful mid-sized to small birds, averaging about 20–25 cm in length. The tinkerbirds are smaller, ranging down to the Red-rumped Tinkerbird (Pogoniulus atroflavus) which weighs a mere 7 g and averages 9 cm (3.6 inches) in length. They are plump-looking, with large heads. Their heavy bill is fringed with bristles. These mostly solitary birds eat a variety of insects and fruit, including figs. They will also visit plantations and take cultivated fruit and vegetables. Fruit is eaten whole and indigestible material such as seed pits regurgitated later. Regurgitation does not usually happen in the nest (as happens with toucans), although tinkerbirds do place sticky mistletoe seeds around the entrances of their nests, possibly to deter predators. 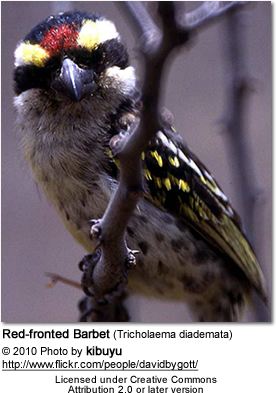 As the other barbets, They are believed to be important agents in seed dispersal. 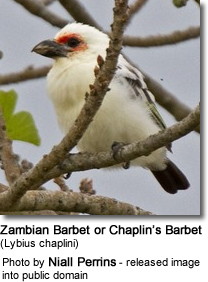 In addition to fruit, African barbets also take arthropod prey, picked from the branches and trunks of trees. They are the most insectivorous of all barbets - and take a wide range of insects, cicadas, ants, dragonflies, crickets, locusts, beetles, moths and mantids. Scorpions and centipedes may also be taken. Some species will take small vertebrates, such as lizards, frogs and geckos. Some species will nest in riverbanks or termite nests. They nest in holes excavated into a tree. The average clutch consists of 2 to 4 eggs. Incubation and raising of the young are shared by both parents. The incubation period is about 13 - 15 days.